Palestinian schoolchildren sit inside a classroom at an UNRWA-run school, on the first day of a new school year, in Gaza City, Aug. 29, 2018. Photo: Reuters / Mohammed Salem. Jordan said on Thursday it would lead a campaign to raise funds for the UN agency that supports Palestinian refugees, to help it survive after the United States cut its funding. Foreign Minister Ayman Safadi said a meeting next month in New York on the sidelines of the UN General Assembly would mobilize support for the United Nations Relief and Works Agency (UNRWA) to continue core education and health services. “Any shortage in funding will drive hundreds of thousands towards deprivation and despair,” Safadi, whose country has 2.2 million UN-registered Palestinian refugees, said in Amman after meeting Pierre Krahenbuhl, the UNRWA head. Jordan will call for an Arab League meeting to lobby for donors to cover the $200 million shortfall needed to shore up UNRWA, Safadi said. UNRWA has faced a cash crisis since the United States, long its biggest donor, earlier this year slashed funding, saying the agency needed to make unspecified reforms and calling on the Palestinians to renew peace talks with Israel. The agency was founded in 1949 after the first Arab-Israel war, in the wake of the exodus of around 700,000 refugees who fled or were driven out of Israel on its founding as a state. UNRWA now looks after more than 5 million descendants of those original refugees, in Jordan, Lebanon, Syria and the Palestinian territories of the West Bank and Gaza Strip. “One cannot wish 5.3 million Palestine refugees away. 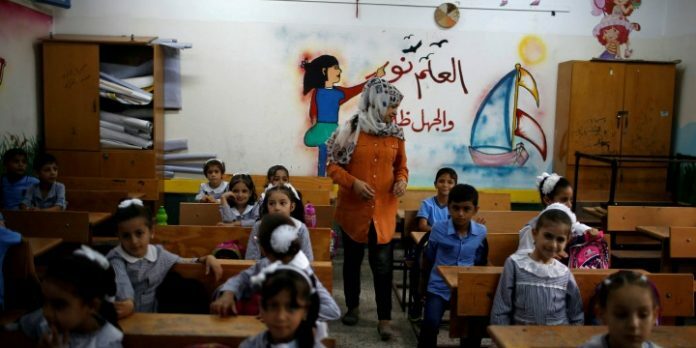 These are people who have rights and for many years now, for decades have faced a plight and injustice that is simply immense,” UNRWA’s Krahenbuhl said at a news conference with Safadi. The Palestinians assert the right under international law to return to homes abandoned in Israel or be compensated. Safadi said funding cuts for UNRWA undermine that right. “The continuation of UNRWA means continued commitment by the international community to working towards a just solution of the refugees that guarantees the right of return and compensation,” Safadi said. Safadi last week raised the plight of UNRWA with U.S. Secretary of State Mike Pompeo in Washington where officials say he warned of “dangerous consequences” to regional stability if the financial crisis were not resolved.